Enjoy a tea party in the afternoon at the artist's home. She baked the cookies too! 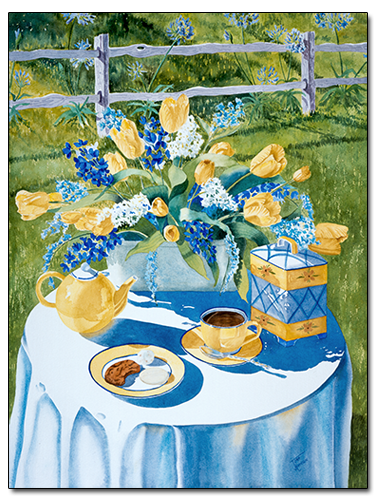 The sunlit yellow dishes cast beautiful patterns of blue shade across the white table cloth, and together they compliment the yellow and blue flowers in the bouquet. This painting is available. It is framed with a gold leaf moulding and linen liner. When you make your selection, click on the Add to Cart button to finish your purchase. Free shipping for this original painting!